We offer the possibilty for people to sell items for Artesania Sorata and thereby help our artisans and the projects that we support. You do not have to be an established business to sell our products and help with our work here. Our minimum order is $300. This means that you can buy a selection of items at wholesale prices to sell to your friends, colleagues or at a local fairtrade fair. Sent with your order will be more infomation about Artesania Sorata and Bolivia. For a price list and any other information please contact Diane Bellomy at cnsorata@yahoo.com. 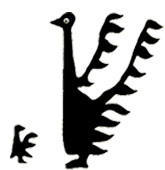 The profits from Artesania Sorata are used to fund these two projects that help disadvantaged children. Both rely on volunteers and fundraising for their existence. We use the funding for the projects to employ a family therapist at the children´s home as well a social worker and signing interpreter in the hearing program. 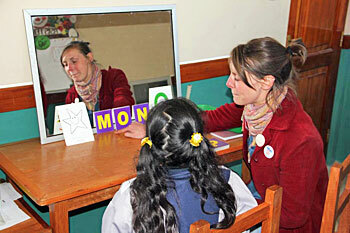 We also provide donated hearing aids and transport to the special needs school for deaf children . These projects are funded by kind hearted individuals around the world as well as Artesania Sorata itself. We welcome contributions and fundraising intiatives are always wonderful to be involved in. We also welcome any possibilities for mutual development with related schools or programs around the world. For more information please contact Diane Bellomy at cnsorata@yahoo.com. We welcome artists with experience or interest in working in textile arts. 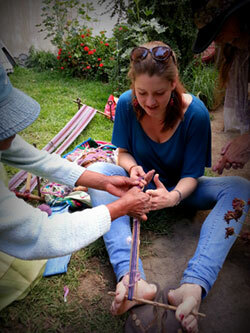 Our invitation extends to spending time in Sorata and La Paz with our textile artists, both learning and teaching. We hope that this collaboration will enrich the artistic understandings of both parties and enable our artisans to continue to develop artistically. This program usually works best on a time scale of two to five months and can easily be combined with our creativity program. For more information please contact Diane Bellomy at cnsorata@yahoo.com. If you would like to view a video of a visit to our workshop, view this clip from one of our tours. 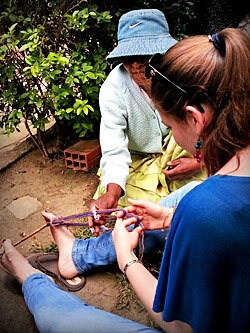 Artesania Sorata continues to expand its programs for training artisans and promoting fairtrade. If you would like to make a donation that will directly influence the well-being of Bolivian artisans press the PayPal button below.